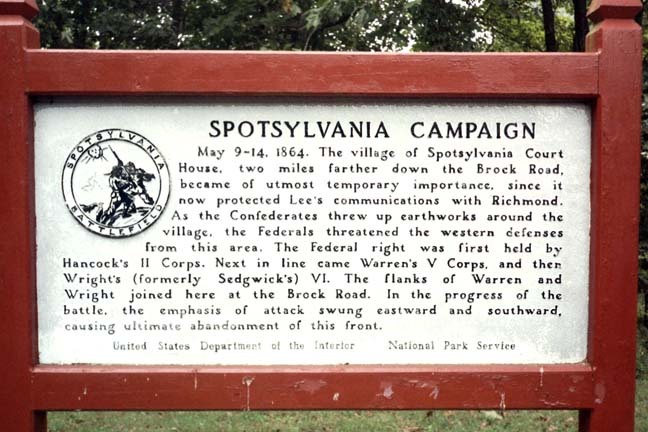 "The village of Spotsylvania Court House, two miles farther down the Brock Road, became of utmost temporary importance, since it now protected Lee's communications with Richmond. As the Confederates threw up earthworks around the village, the Federals threatened the western defenses from this area. The Federal right as first held by Hancock's II Corps. Nex in line came Warren's V Corps, and then Wright's (formerly Sedgwick's) VI. The flanks of Warren and Wright joined here at the Brock Road. In the progress of the battle, the emphasis of attack swung eastward and southward, causing ultimate abandonment of this front."